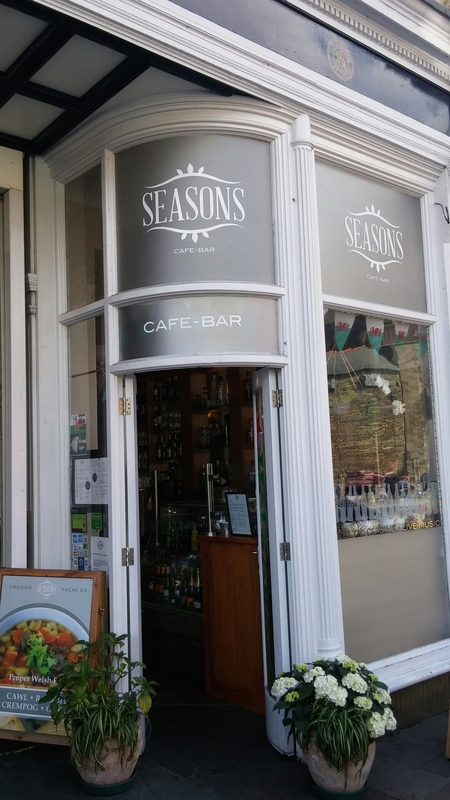 After a deeply disappointing return to the self styled “only Welsh restaurant in Cardiff”, Pitch bar and eatery a while back, I happened upon some Tripadviser reviews on a place called Seasons Cafe bar in Cardiff. These waxed lyrically (bar from a few old miseries, who sounded a bit like me) about the Welsh food on offer in the place. 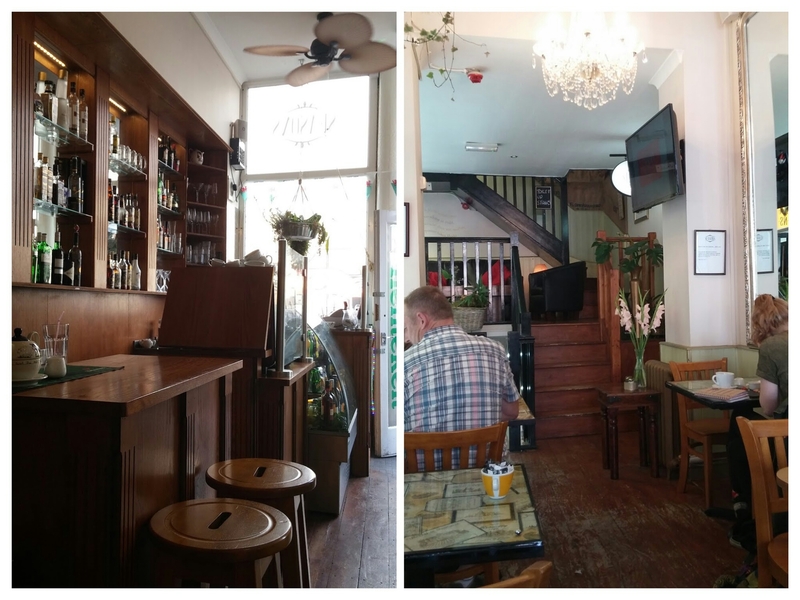 I always take Tripadviser reviews (good or bad) with a massive pinch of salt, but filtering out the extremes most views on the place seemed genuine and, as a result, it was put on the ever growing list of places to go for lunch with J. After many a false start (J, then I, cancelling on a number occasions due to pesky work commitments) we made it to the place. 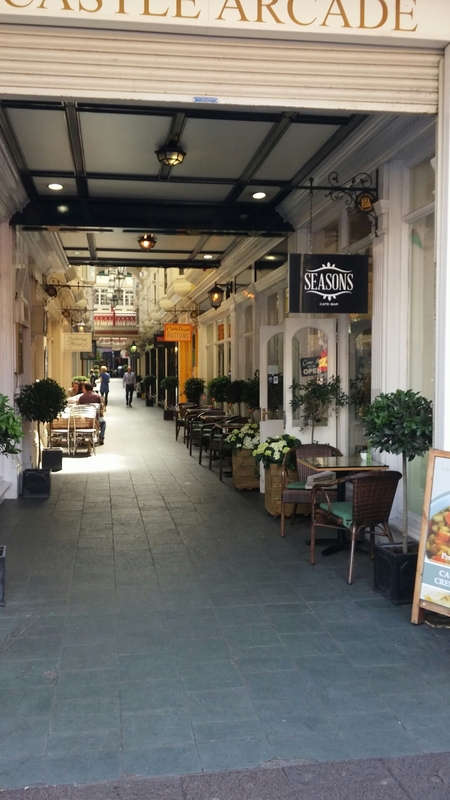 Nestled at the top of the very picturesque Castle Arcade and sitting directly opposite Cardiff Castle, it has a good location with lots of passing trade including many a tourist visiting the Castle. Inside it is a long, narrow space, but in keeping with the Welsh theme is quite “cwtchy” (cwtch being a rather nice Welsh word for somewhere cosy or for a cuddle or hug). It is independently owned which makes a nice change from the identikit chains. For lunch, the menu lists a number of “Welsh Specialities” including Cawl (for non Welsh based readers, a chunky broth with meat – usually lamb and root vegetables which is the national dish of Wales), Welsh Oggi(e) (a much loved Welsh version of the Cornish pasty and the rationale behind the somewhat odd post title – it being a refrain made famous by Max Boyce and often heard at many a Welsh hen night/weekend and during rugby events in the Capital) and a filled Crempog (a Welsh pancake which is thicker than a crepe and akin, as I understand it, to what an American would regard as a pancake). 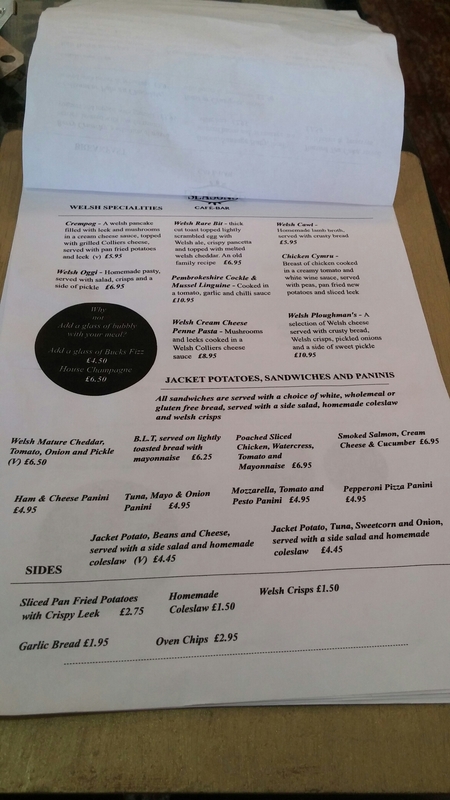 There is also a very strange sounding Welsh rarebit dish that involves scrambled eggs (really!) and pancetta topped with melted Welsh cheddar cheese (family recipe apparently, but a new one on me and not what I would regard as a even remotely close to a Welsh rarebit) and a distinctly non Welsh “Chicken Cymru” dish (where the only Welsh related element seem to me to be the addition of slices of leek). and a “Specials” board which strangely seem mainly to be a repetition of items already on the main menu. As the post title suggests, I went for the Welsh Oggi (spelt this way on the menu but more commonly spelt as Oggie, I believe). 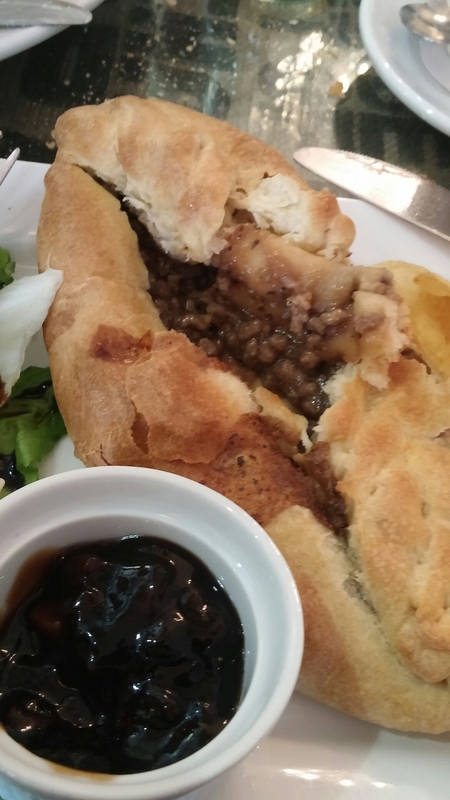 Whilst I may be shot (in Cornwall) for saying this, it is argued by some here in Wales that the Welsh Oggi(e) pre-dates the Cornish pasty by quite some time, with historic references to it as far back as 1181 in terms of people being fed them at St David’s Cathedral. Whatever the merits of this argument, the Cornish pasty has PGI status and the Welsh Oggi(e) does not so that somewhat puts the Welsh Oggi(e) in its place. 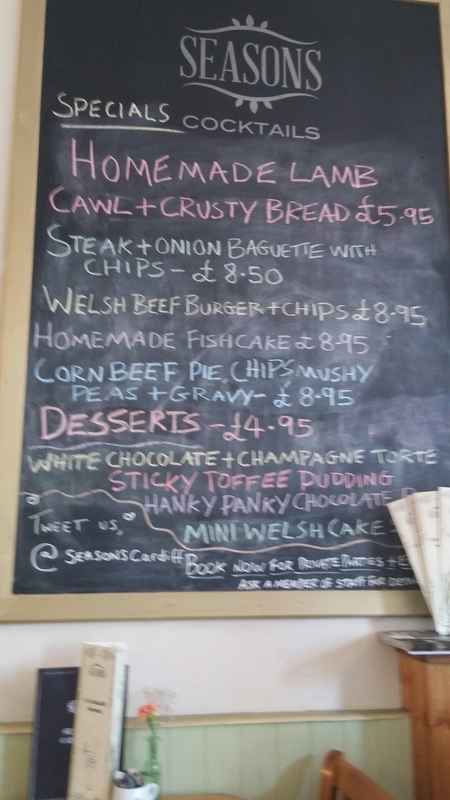 Season’s Welsh Oggi(e) (£6.95), is homemade with a nice pastry and a tasty, well seasoned filling of beef mince and onions, within a rich gravy. Whilst a little misshappen (gave it a bit of character and showed it was homemade) the meat and gravy had an excellent flavour with just the right amount of seasoning. 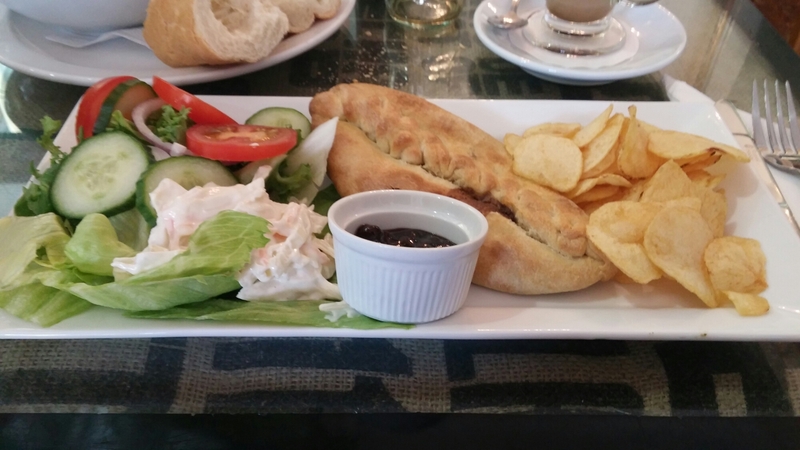 It came with decent sides of crisps, a fresh crisp salad (which was worthy of the name, as opposed to the pathetic afterthought some places put on the plate), and a pot of, branston like, pickle. 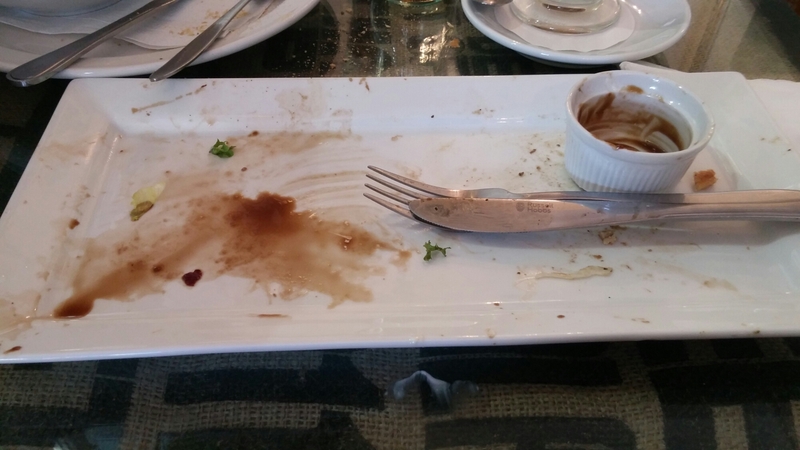 The salad was undressed, but balsamic and oil was provided on request (with the option of a casear dressing also available). Filling and very enjoyable sums my oggi(e) up. 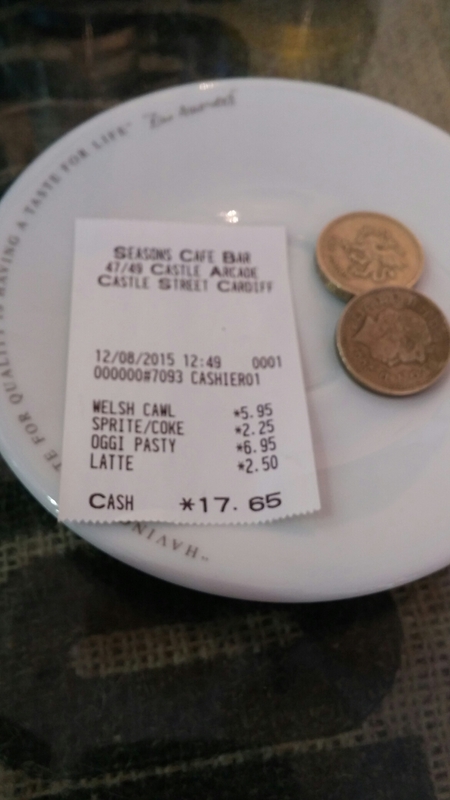 J, playing ball with the Welsh theme (much to my relief), went for the Cawl (£5.95). This was a good portion size and pronounced as excellent (I didn’t get a look in) with a decent proportion of tender lamb to veg. and a very flavoursome broth. The kitchen here clearly knows how to season properly – which is perhaps apt bearing in mind the places name (not what they intend it to mean I suspect). It was polished off with gusty by J. 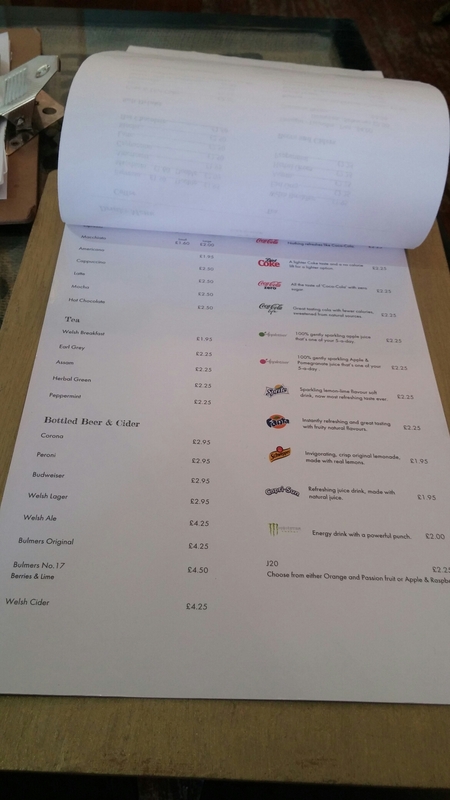 It being a mid – week lunch, booze was off the agenda so it was hot or soft drinks. 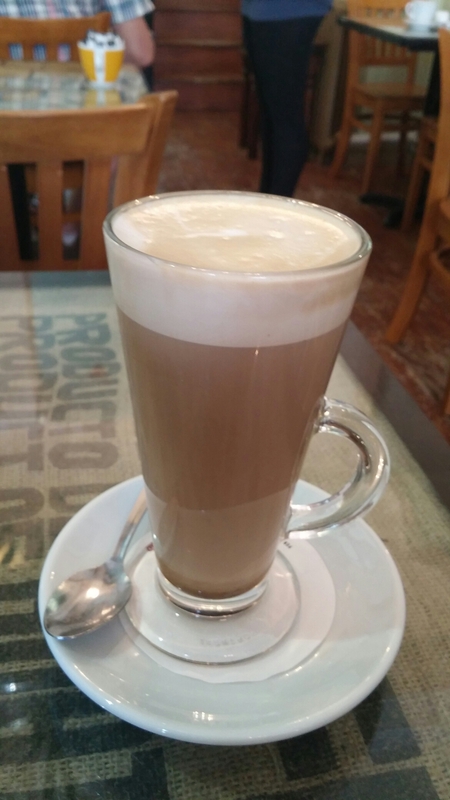 They have a reasonable selection of coffees, but the latte (£2.50) I ordered was a tad weak for my tastes. 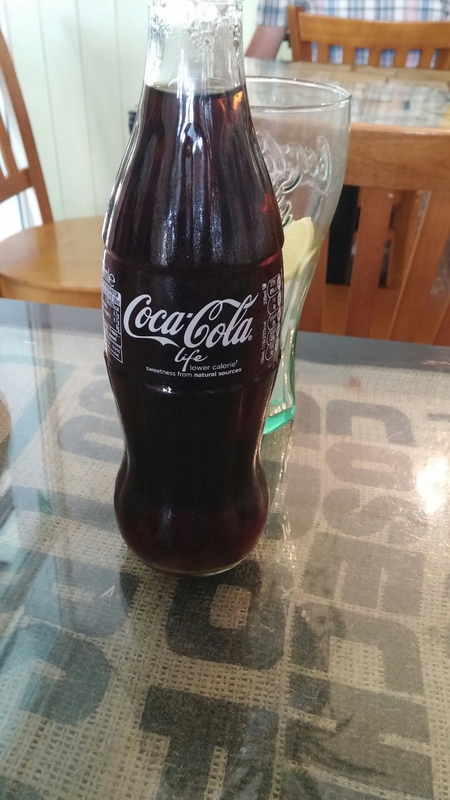 J had a Coke Life (no idea how that differs from other cokes) which came in a bottle(£2.25). This led to J and I pondering why it is that Coke always tastes so much better in a glass bottle. A can is a step down, a plastic bottle worse and those shower head things are right at the bottom of the pile. Only the case with Coke mind – with Pepsi etc. a glass bottle doesn’t make any difference (at least to my mind). On the booze front they have a short selection of beers (including some Welsh ones) and wines which seemed reasonably priced. 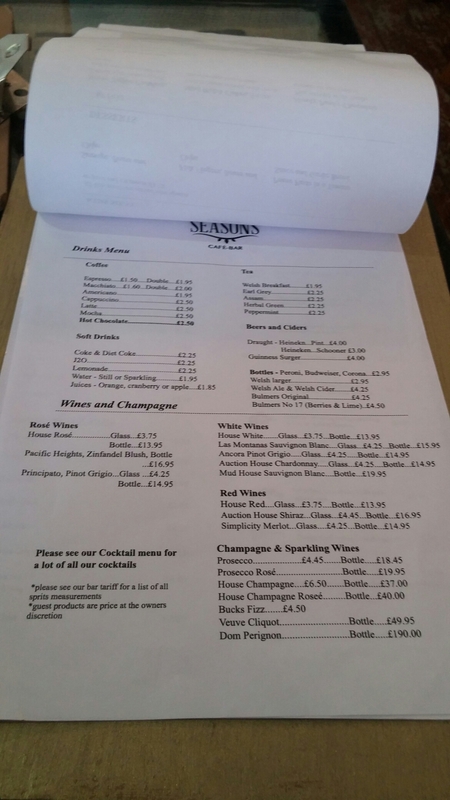 The wine selection is, however, rather boring and lacking anything Welsh, which is a shame given the Welsh dishes on the menu. Plenty out there guys – so how about a Welsh fizz on the list such as the multi award winning sparkling wines from Ancre Hill. 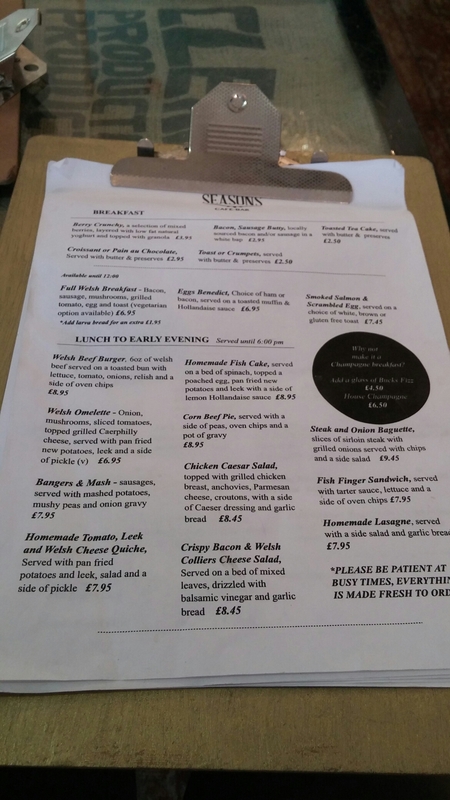 An excellent lunch at Seasons, which makes for a perfect spot for a mid – week lunch or to break up the shopping on the weekend. Service was efficient and friendly. As a result a tip was well deserved. The damage was £17.65 (including drinks but excluding tip) for the two of us which I thought very good value for what we got. Good, tasty food at very reasonable prices makes Seasons hard to fault. Would go back? Oh yes – loved the oggi(e) and plenty more of interest on the lunch time menu. They also open in the evenings Thursday to Saturday and offer nice sounding breakfast items all week. 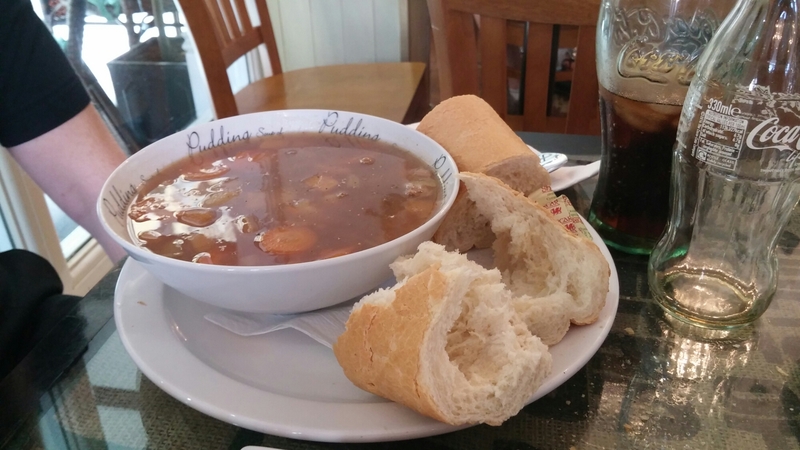 This entry was posted on Aug 23, 2015 by solicitingflavours in Cafe, Cardiff, Drink, Food, Food and wine products, lunch, lunchtime, Non alcoholic drink, pasty, Restaurant Review, review, Seasons cafe bar, Wales, Welsh food, Welsh wines, wine.